This page includes The Club News columns from the 1999 issues of Across the Fence Post. 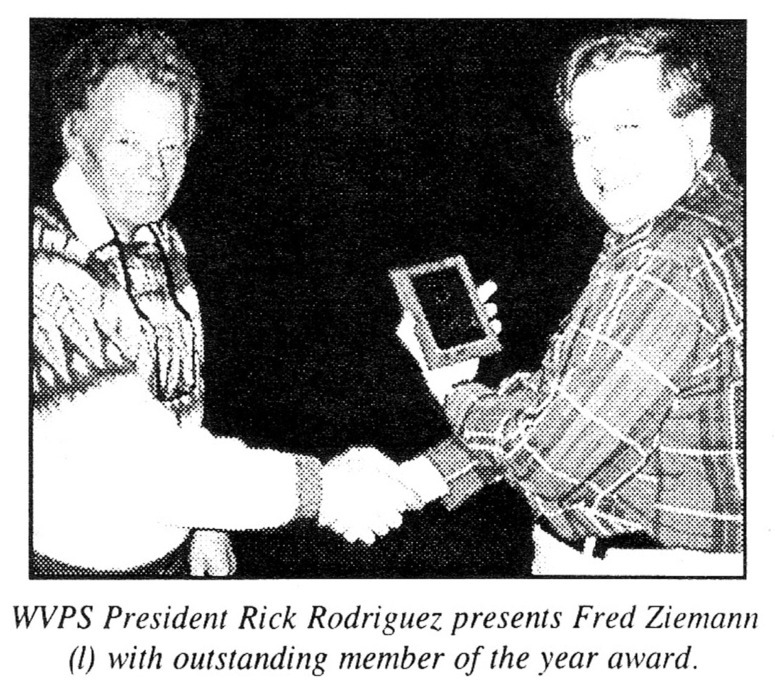 A highlight of the WVPS's 1998 Christmas party was recognition of several members who have made major contributions to the club. Fred Ziemann received special recognition as outstanding member of the year. Zietnann is the club's treasurer and newsletter editor. He also handles youth activities and coordinated the group's extensive Mara-thon County Wisconsin sesquicentennial cancels project. 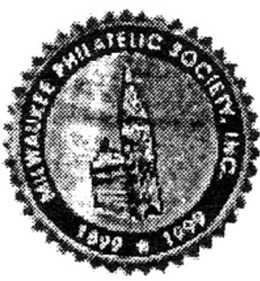 Milwaukee-area clubs will hold their l3th annual Distinguished Philatelist Appreciation Dinner on March 21, 1999. This year's honoree is Roger Szymanski. He was selected for the honor because he has repeatedly supported the hobby of stamp collecting. Roger has served several Milwaukee-area clubs over a period of many years. 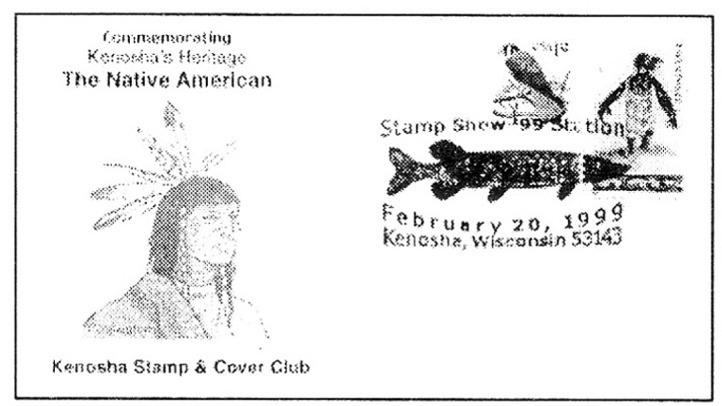 The Polish American Stamp Club hosts the 1999 event. The club's 28th annual exhibition paid tribute to Kenosha's Native American heritage with a cover depicting a Potawatomi Indian brave. The cancel features a pike, which recalls that Kenosha was once known as the Village of Pike. To mail order, send a No. 10 SASE plus $1.50 each to: Kenosha Stamp and Cover Club, P.O. Box 1524, Kenosha, WI 53141. Congratulations to MPS, which celebrates its 100th anniversary in November 1999. MPS meets the third Wednesday of each month at 7 p.m. at Zablocki County Park Pavilion, 3716 W. Howard Ave., Milwaukee. The WPHS requests you’re input regarding collector interest in a proposed project to catalog covers showing auxiliary (and ancillary) marks from Wisconsin post offices. Such marks were generally rubber stamps and include but aren't limited to: "Returned" for any reason straight line or hand, "Postage Due," "Damaged in Handling," "No such office in state named," and "Unknown. " If you'd like to see a publication listing these markings, write to: Frank Moertl, Secy., WPHS, N95W32259 County Line Rd., Hartland, WI 53029. In honor of POLISH FEST '99 (June 18-20) the PASC has produced a set of three multicolored postcards featuring Polish pianist Frederic Chopin. The special cancel notes the 150th anniversary of Chopin's death. To order the set of three, send $2.50 and a SASE to: Polish American Stamp Club, Box 1920, Milwaukee, WI 53201. 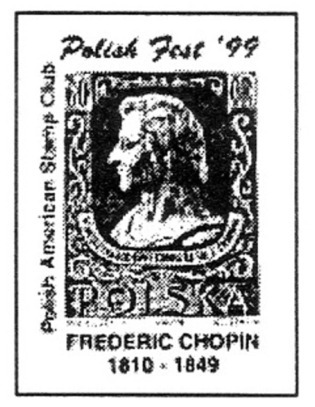 Make checks payable to the Polish American Stamp Club. 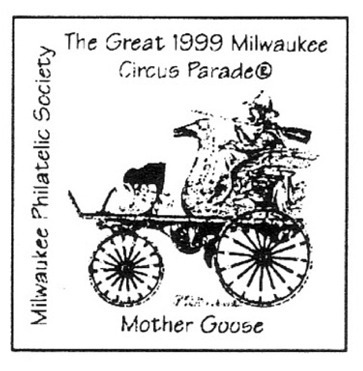 The Mother Goose circus wagon is featured on the multicolored cachet of MPS's 1999 circus parade cover. Covers were canceled each day of the parade with a pictorial clown postmark. The parade celebration was held July 6-10 at the lakefront Veterans Park showgrounds. MPS has issued circus parade covers for each year 1971-73 and 1985-99. Cost of the 1999 cover is $1.50 each or $5 for a set of four. Send orders to: MPS Circus Covers, P.O. Box 1980, Milwaukee, WI 53201-1980. Make checks payable to MPS and include a No. 10 SASE. Tesssa Yahr took a fourth place in the age 11 division of the 1998-99 essay contest sponsored by the American Philatelic Society and U.S. Postal Service. Contestants submitted essays on the theme "How Stamps Teach Us About the World" and a presentation of 15 or more postage stamps complementing the text. Tessa received a $100 savings bond. The CVSC meets at 7p.m. on the third Thursday of each month at the Parks and Recreation Building, 1300 First Ave., Eau Claire, WI. Alice Bieda and Joseph Renkas were honored as members of the year by receiving the Jack Larsen Memorial Award. Serge Logan received a special Outstanding Achievement Award for his 10-year service as newsletter editor. Irmgard Daniels earned the Lifetime Achievement Award for 25 years of member-ship with the club. On June 27, 1999, Mel Stahl became the newest member of the JSC's Hall of Fame. Stahl received the honor for his outstanding service to the club and efforts in promoting philately.